Preheat oven to 350 F, line the bottom and sides of 9 x 9 inch pan with aluminum foil or baking paper (leaving overhang on all sides so you could easily lift the brownies out of the pan), set aside. In a medium sauce pan over low-medium heat melt the chopped chocolate and butter, stirring constantly, until smooth. Cool for 10 minutes. In a small bowl stir together flour, cocoa powder and salt, set aside. Add ¾ cup of granulated sugar into melted chocolate and whisk until combined. Add eggs (one at the time) whisking well after each addition. Whisk in vanilla. Gently fold dry ingredients mixture into chocolate mixture and pour into prepared pan, smooth the top. 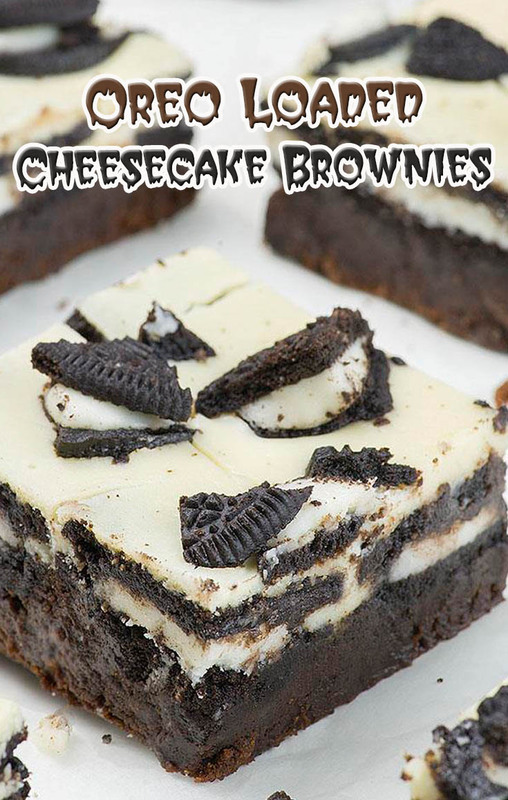 Arrange Oreo cookies onto brownie layer. You’ll need 16 whole Oreos and 4 cut in half to cover the brownie batter. Since the batter is to thick you can gently press the cookies to sink halfway into the batter. To make the cheesecake layer in a bowl beat softened cream cheese until smooth and creamy. Beat in ¼ cup+ 2 Tablespoons sugar and vanilla extract. Add beaten egg and stir until evenly combined. Spoon cheesecake mixture onto Oreo layer and gently smooth the top. Don’t spread cheesecake mixture all the way to the edges, leave 1/3-1/2 inch rim, because cheesecake cold burn out easily. Sprinkle with chopped Oreo and bake 35-40 minutes (until the brownies begin to pull away from the edges of the pan). Cool on a wire rack for 1 hour, then cover and refrigerate at least 2-3 hour.